While walking through the Museum of Art and Design’s exhibition “The Art of the Scent (1889-2012)” my mind was flooded with memories of a nearly forgotten childhood friend, an ex-girlfriend and my deceased grandmother. It was a surprisingly powerful and complex experience, particularly because it was evoked in a nearly empty gallery by an invisible art form—scent. It’s often cited that smell is the sense most associated with memory (both are processed by the brain’s limbic system), and the iconic fragrances exhibited in “The Art of the Scent” are likely to take visitors on their own private jaunts down memory lane. But it might not lead where they expect. Like any art form or design discipline, the creation of a scent is the result of experimentation and innovation. Yet, perfume and cologne are rarely appreciated as the artfully crafted designs they are. “The Art of the Scent” is the first major museum exhibition to recognize and celebrate scent as a true artistic medium rather than just a consumer product. 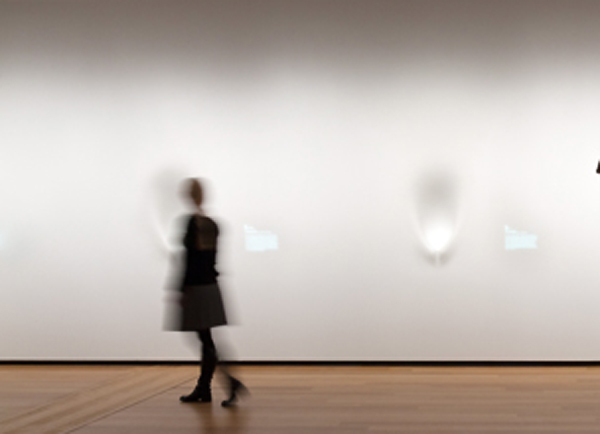 The 12 exhibited fragrances, chosen by curator Chandler Burr to represent the major aesthetic schools of scent design, include Ernest Beaux’s Modernist Chanel No.5 (1921); the Postmodern Drakkar Noir (1982) by Pierre Wargnye ; and Daniela Andrier’s deconstructed fragrance Untitled (2010). Perhaps most significantly, the exhibition begins with the first fragrance to incorporate synthetic raw materials instead of an exclusively natural palette, thereby truly transforming scent into an art: Jicky (1889), created by Aimé Guerlain. Unfortunately, this fragrant historiography will initially be lost on the average visitor because while scent may indeed be the best sense for provoking memory, it is the worst sense for conveying intellectual content. When we smell something—good or bad—our reaction is typically an automatic or emotional response. Such a reaction doesn’t lend itself particularly well to critical analysis. The greatest challenge facing Burr, who wrote the “Scent Notes” column for the New York Times and the book The Emperor of Scent, was to get visitors to move beyond their initial emotional responses and memories and to think critically about scent design. And the greatest challenge facing exhibition designers Diller Scofidio + Renfro was to figure out how to present an invisible art.